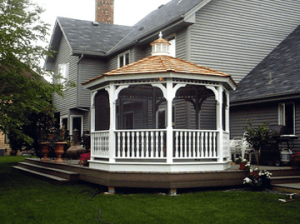 Our skilled crew of carpenters can build or repair your Decks, Gazebos & Porches project with ease and expertise, no matter how large or small the project. Over 25 years experience in building Decks, Gazebos & Porches and more in and around Morris County and North Jersey. A&E Remodeling of Parsippany NJ specializes in the expert design and construction of custom decks, stone patios, elevated decks, retaining walls, outdoor fireplaces, fire-pits, flower beds, pizza ovens, gazebos, porches, covered roofs, pergolas, custom railings and complete outdoor kitchens in Morris County and Northern NJ. Superior construction and exceeding expectations. A&E Remodeling design and master craftsman can work with you at any construction stage. Whether you have a tear-down or brand new deck project A&E handle the job. Superior construction and exceeding expectations has and always will be our main priority at A&E Remodeling.